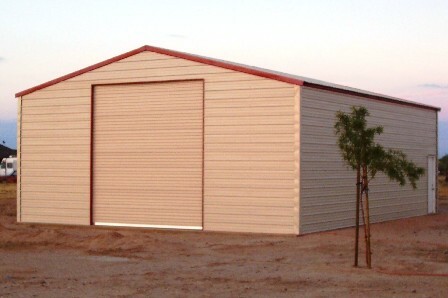 Perhaps the most popular of our metal building kits, the Sierra represents the style you see most often, and boasts our stand alone frame system. 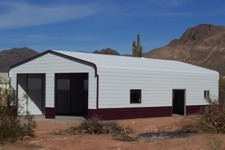 The stand alone system easily allows you to clad or cover the outside of your building with most any type of exterior material such as steel or vinyl lap siding, stucco, masonry, fiber board, etc, without modifying the frame system or having to add steel components in order to attach your chosen exterior materials. The choice is yours. Should you elect to use steel panels for the exterior, the panels are attached vertically on the walls and roof, meaning that the formed grooves in the metal are vertical – the best orientation for shedding rain and snow. 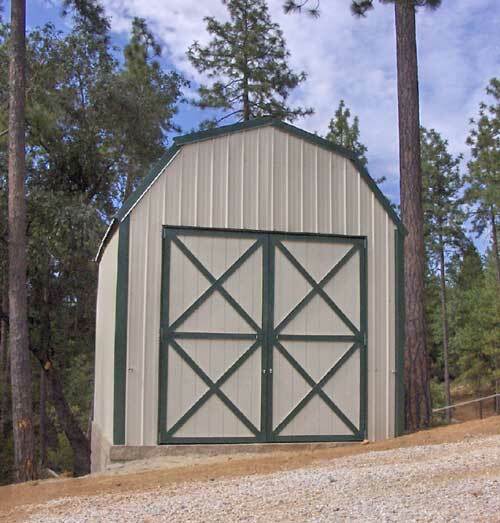 Based on a long design tradition, the Sierra series building is one of the friendliest and most hassle-free of all building styles. 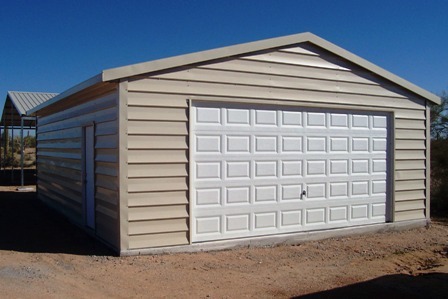 The Mohave style building gives you all the engineering ruggedness of the Sierra, and very nearly the same look, too – we’ve just managed to make this building a touch more economical for you. Because the Mohave’s wall panels are attached horizontally rather than vertically (as with the Sierra style) horizontal members between studs (called girts) aren’t needed. This lowers material costs, and makes installation a bit quicker. As you can see, you still end up with a fine-looking, highly serviceable structure, at a price that’s just a bit easier on the budget. The Teton style was designed to blend in just beautifully, especially in residential applications. The Teton’s exterior panels are applied in a horizontal fashion, and formed to have the look of traditional wood shiplap siding. 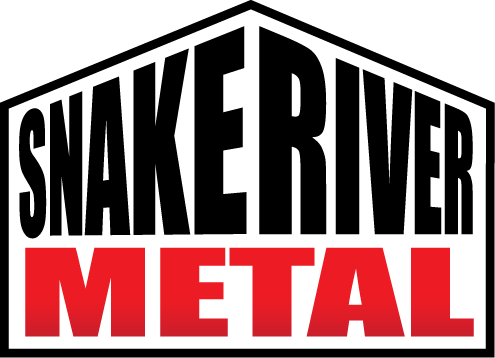 Panel installation is a simple and straightforward task – and the tough, 26-gauge panels mean your building will give you years and years of dependable service. A metal soffit under the eave extensions adds to the building’s style and residential appeal. 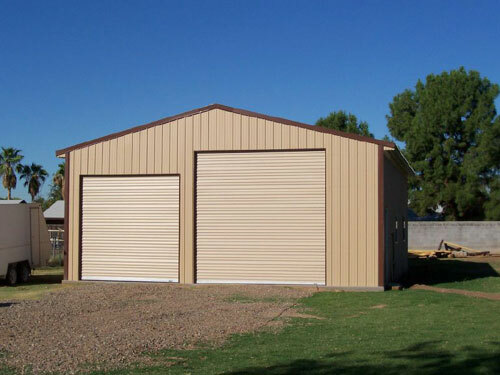 The Sonoran metal storage building is Absolute Steel’s version of a “Quonset style” building – but we think it’s got a good deal more style, with its more traditional profile and trim. 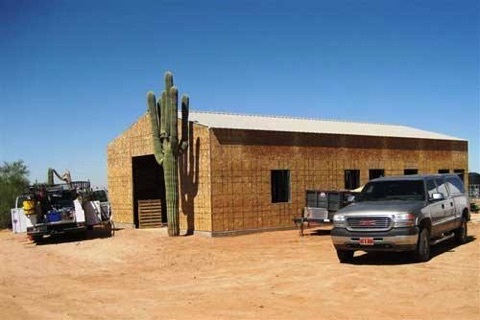 This is our most economical building style, since it it really needs no frame components other than the main vertical supports and rafter system. Simple, good looking and durable. 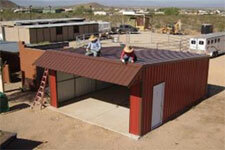 A beginner, using just common tools, will have no problems erecting a Sonoran style building. We should note that this building style isn’t recommended for areas that get substantial snowfall. If you’re in snowy country, one of our other styles will be your best bet. The Maricopa building features a distinctive design – and offers ample useable storage and working space. Due to engineering considerations, this style is a bit more limited in overall size than our other designs. The recommended sizes in this style are either 24’ or 30’ wide, by 24’ long, with a 10.5′ high front end and an 8.5’ high back end. The roof’s slope is a gentle 1/12 (1 foot of rise for every 12 feet of horizontal distance), so while it will shed rain just fine, this is not the building for snow country. 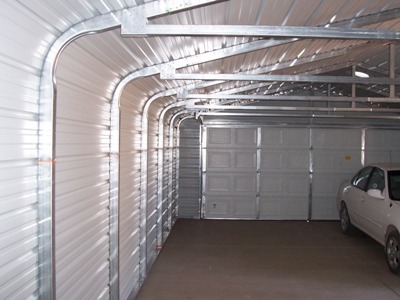 Two 10’ wide by 7’ high roll-up doors can be centered on the building’s front end. If you like, steel roofing panels simulating traditional clay tile roofing can be used along the building’s front roof overhang.